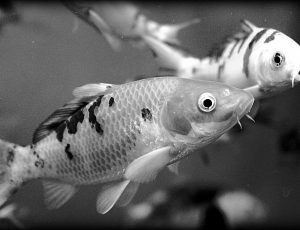 SFBayAreaKoiClub.org - How old do Koi need to be, to spawn? How old do Koi need to be, to spawn? Hello I have 3 koi fish that are about a year old, and I was wondering if they can in fact mate and lay eggs that are fertilized and will hatch into baby koi fish. I am asking because before my husband and I got our fish I was reading about them online and it said that typically they don’t reach sexual maturity until the males are about 2 year old and the female’s at about 3 year old. But they are showing all the signs of mating already so I’m just kinda confused as to what to think or look for, to be sure I see the eggs and don’t think that they are something else and throw them away while cleaning the pond. Also I was wondering if you could possibly tell me a little bit more about the whole mating process of koi fish, for example, like what Time of year, how to tell if they laid eggs (and what they might look like), how to tell if they have already mated, etc. etc. etc. But all/any information you can come up with or share with my husband and I would be an amazing help to us. Thank u in advance for your time and consideration in our matter. We hope to hear from you soon. Thanks for getting in touch. The whole “rules of spawning” thing can get a little tricky. You had mentioned the age of your fish. I always ask when hearing the age of a fish, if this age being given is based on the fish keeper having the fish since it was a tiny baby 1 day old fry up until now and its been 1 year? Or, have you had the fish 1 year and purchased it as a “baby”? Most koi will probably be about 1 year old by the time they even make it to market. Many fish can spend several months or even up to a year on the market before they find their “forever pond”. It can be difficult to know the true age of a fish, and it definitely cannot be based on date of sale! Telling the age of a fish can’t be based on its size either, a big fish may not be that old, and an old fish may not be that big. Telling the true age of a fish, unless you are the breeder, takes some training and some veterinary skill to find certain indicators in the physiology of the fish that will reveal how old it is. Sexual maturity is important, critical really, but there are alot of factors that will effect sexual maturity and the ability and drive to reproduce, just like people. Whatever the case, koi and goldfish can exhibit spawning behavior prior to them having the actual ability to spawn. Sometime actual spawning behavior will result in eggs being released sometimes not. Sometimes eggs get released and are immediately eaten. So it gets tricky. Spawning behavior among koi and goldfish can be a pretty brutal affair, and many fish keepers will confuse it with fighting. Part of the courtship involves exhaustive chasing and nipping of the female koi. Females will jump out of ponds at times,or try to hide in skimmers, or wedge themselves between plant baskets, rockwork, or other objects in the pond. It is an extremely active time in the pond and will typically be followed by some foamy smelly murky water conditions. It is an interesting behavior to witness, and an amazing act of nature typically occurring in relation to water temperature changes and some other factors. I wrote a blog on spawning, you should check it out. The best way to tell a koi’s age is by checking out it’s ear bone believe it or not (hence the veterinary skills!). My preference is a good educated guess as to how old a koi may be give or take a year. Good luck, and thanks for the question!